Magi's blessing Really good now. Health and Crowd control reduction replaces Reinforced Greaves and is better then Hide of Leviathan. The passive is great against a team with high crowd control and combined with Winged wand, You've got a ticket out of jail. Cool-down reduction passive is great on any support because it means more abilities in a less amount of time. Stats also benefit Ymir's survivability, and mana. Combined with the 'free ticket out of jail' thing. The passive is a lifesaver, even when it was nerfed. I believe this item is better then Stone of Gaia because you don't need sustainability for ymir because you don't soak up damage, That's not your job. Just for the health and mana. The magic power is optional. You don't have to buy this item but if you're versing a team full of burst mage and physical then buy it. NOTE: You can buy any other items after Boots of Celerity, Winged wand and Magi's blessing. These 3 items are a core for this build, the rest is entirely up to you. - You are NOT there to soak up damage like Hercules HOWEVER you are subject to tank a tower for pushing. PLEASE READ: This is a simple guide telling you what to build and what to do. This can be hard to do sometimes and will not always work, nobody is perfect. I am not responsible for your losses, kdr or elo loss because that stuff is entirely up to you. Amazing. Just amazing. The build works so I'll upvote, but I wish you could make it a full guide. 37807 Subzero008 Amazing. Just amazing. The build works so I'll upvote, but I wish you could make it a full guide. Great guide! but i was thinking...instead of bulwark of hope u buy stone of gaia? what do u think about that? You I would rather have Bulwark of Hope in situations where there is a large amount of damage going on, the passive has more of a chance to save you then Stone of Gaia. 27296 Eyeplod [quote=IMBAPUCK] Great guide! but i was thinking...instead of bulwark of hope u buy stone of gaia? what do u think about that? [/quote] You I would rather have [[bulwark of hope]] in situations where there is a large amount of damage going on, the passive has more of a chance to save you then [[stone of gaia]]. 26500 IMBAPUCK Great guide! but i was thinking...instead of bulwark of hope u buy stone of gaia? what do u think about that? 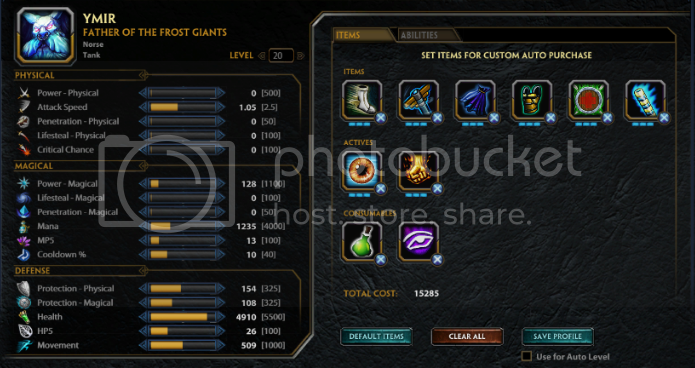 Guide is now updated for the Thanatos patch. 26248 Eyeplod Guide is now updated for the Thanatos patch. Great guide won a lot of games using this build. The thing i like about the build is their is a lot of variety from other ymir builds which makes this one such an excellent one. 4539 Timoshi Great guide won a lot of games using this build. The thing i like about the build is their is a lot of variety from other ymir builds which makes this one such an excellent one. Good job!